Salvia sonomensis (Creeping Sage) - A creeping flat perennial sage that can spread to 10' across. The sage flowers are blue-violet from May to June, appearing in a 6"spike above gray-green leaves that lie on the ground 1" or so high. 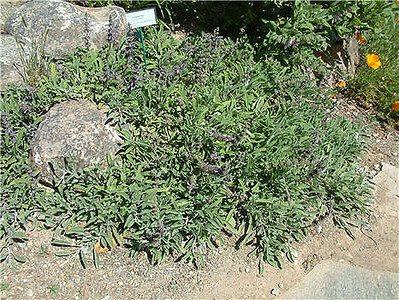 Creeping sage is native to dry slopes in the coast ranges and Sierra Nevada foothills. Seems to grow at its best in shade/part shade, under shrubs or in the shade of shrubs like Manzanita or Mountain Lilac. Cold tolerant to about 0 degrees F. This plant is temperamental if planted in interior full sun. At its best one plant will cover an area 10 by 15 feet, but in hot sun the plant may die back to the crown in one day when it gets too hot or dry (110F and 10 inches or less of annual rainfall).